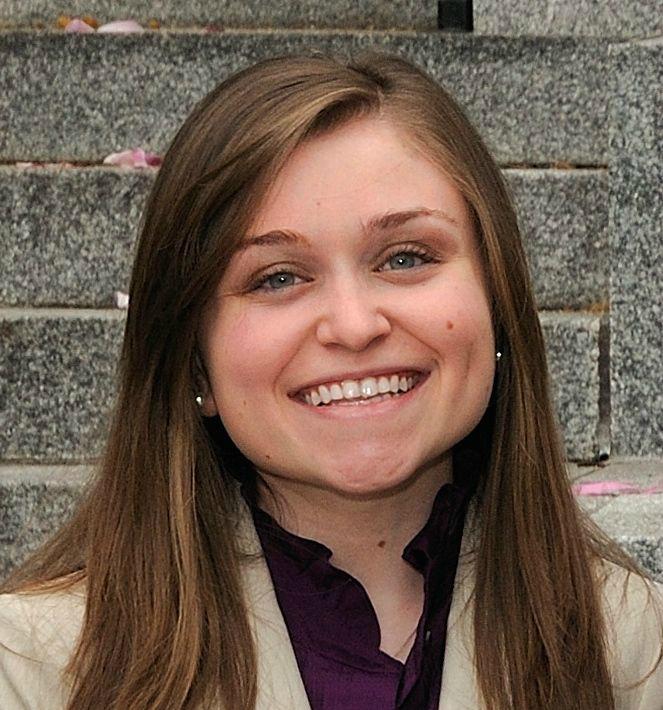 Just three years ago, Elizabeth (Beattie) Hunter was an undergrad engineering student at the University of Pennsylvania School of Engineering and Applied Science and finalist in the Collegiate Inventors Competition. Elizabeth and her colleagues had submitted their capstone project, the Titan Arm. Their project was an exoskeleton that provides the wearer with an extra forty pounds of bicep strength. Today, Elizabeth is a Ph.D. student, working on developing micro-biotic systems that are smaller than the width of a human hair. The tiny robots, propelled by organisms like E. coli, can sense toxins, chemicals, or light and might be able to diagnose disease or deliver drugs. To kick off this year's CIC Competition to be held in November, I sat down with Elizabeth to discuss the impact her participation had on her career, as well as the role of women in STEM. The CIC Competition just announced this year's participants. What can you share about the experience with this year's participants? The CIC Competition was so inspiring. I got to interact with other innovators who were peers my own age. CIC encourages entrepeneurship. From my perspective, taking part in the competition reaffirmed my entrepreneurial aspirations by showcasing innovations that have real impact. It's great to develop technology but how can it be useful? It's important to ask how academic research or even senior capstone projects can be translated and used. What impacts and utilities does it have? CIC is a gateway to help those who want to start companies with developed technologies. It's a real springboard. Can you explain the project you presented? The project I presented was something I developed along with three of my classmates at Penn as our capstone engineering project. We developed a power upper body exoskeleton that magnifies the wearer's strength by 40 lbs. to be used for physical rehab for upper body or shoulder injuries. It's affordable and compact so a patient can use to do physical therapy exercises at home. It provides a quantifiable metrics for the physical therapist because there's a sensor mounted on all joints that can show data and improvement over time. How did you become interested in biomedical engineering? I was formally trained as a mechanical engineer, which is the broadest of all engineering disciplines. It's very interdisciplinary. I was trained to analyze forces on an object, not only to create and build but also to program computers, build electrical circuits, and to apply to biology. The relationship I am passionate about is the interaction between biology and medicine with engineering, to bridge the gap and to bring tools to develop better diagnostic and therapeutic measures. What advice do you have for girls considering a career in STEM? I'm very passionate about engineering education and bring more women into the field. What helped me was finding mentors and people to advocate for me. The most important thing is also realizing your weaknesses and identifying people to be part of your team who can fill that gap by offsetting your deficits. Interdisciplinary teams make for better designs and solutions. What are some challenges faced by women in technology? As a woman, you've got to be resilient. Engineering is hard but that's not a reason not to be an engineer. As a woman, you're faced with unique challenges. Not only do you have to navigate academics but also in a strategic way, navigate professional and social challenges. Whether you realize it or not, everyone has certain gender biases. People often perceive a woman engineer as less capable. For those of us new to the field, our job is to prove them wrong - to persevere. When backed down, we've got to be resilient and keep moving. What or who influenced you to pursue STEM? Growing up, I was always interested in science. My dad tells a story that as a kid I was constantly asking questions about why things were the way they are or how something worked. My parents encouraged me to probe and even sent me to the Camp Invention program. My advice to parents with sons or daughters interested in engineering or science is to nurture that creativity and that curiosity as much as possible. What do you think discourages girls from pursuing STEM? Not thinking it's "cool." Lots of adolescent girls shy away from math and science when it's actually fun to be an engineer! You get to create things that no one else has created, to answer questions that no one else has answered. Breaking that stereotype is important to retain young women's interest in science. It's often presented as memorizing facts and regurgitating what has been presented when in reality, students should be tasked with asking questions and finding new paths to learn. Even if you don't have friends in the class, take every opportunity to explore interests and creativity. I'm working on robotics. People often view robotics as science fiction but we're coming to the point where many of the things we see on TV or in movies actually exist and are making an impact! For example, we can use 3-D printing technology to print organs on metals or plastics or place an organ on a chip. For more information on CIC, visit http://collegiateinventors.org/.